What follows is really some very random thoughts that are an extension to series 3 episode 4 of Photo Chat Vlog. I said in that episode that I didn’t have a favorite picture of the three that I discussed, but on reflection I only realized long after I had finished the recording and put the video together that actually I do have a favorite picture and it’s this one, the color one taken on 35mm film. At the time I said the reason I was inspired to take those pictures that day was because we were in the cafe and the sun was going down and the quality of the light was what I wanted to capture. But that whole idea that I talked about, about how knowing that the day is different because of how you perceive the light actually has a nostalgic origin for me, and actually when I was in that cafe and I picked up what I’m going to call a feeling tone. I would have once called it a memory. I would have once called it a vibe or something, but basically it is a reminder of a particular point in my life and on reflection I think when I pulled out the camera I was channeling that somehow. The point in my life that I’m talking about is actually from when I was about between 10 and 11 years old, and what happened was I was at junior school, a big old Victorian school building in my hometown and we had an after-school art club. Now I normally went to school at nine o’clock in the morning, and I went home at 12 o’clock and had my dinner and went back in the afternoon at 1 o’clock and I came out at 4 o’clock to go home and have my tea at 5 o’clock, and my life was absolutely regimented around those hours. That was so regimented that even when it wasn’t school, like in the holidays, it was still always dinnertime at 12 o’clock, and it was still tea time at about 5 o’clock and my whole life between about age 4 and about age 11 was ruled by that timetable. But when we were doing this art class I was in the school after hours, and the actual building became a different sort of place, because all the other kids had gone home and we were left behind in the school with just one teacher doing our extra art class. My day took on a different shape as a result, and I remember it was during the spring and the start of the summer that year, and I have a strong memory of being in this strange, quiet version of school and seeing the Sun coming through coming through the doors that led to the playground. It was this afternoon/evening sun lighting up the quiet school that stands out for me, a quiet, end of the day moment in a place where I wouldn’t normally be, and which was normally full of hundreds of kids. Afterwards I would go out into the playground where there were no other kids and I would go home at a different time, and my normal world was twisted slightly on its axis on those days I did the after school art class. 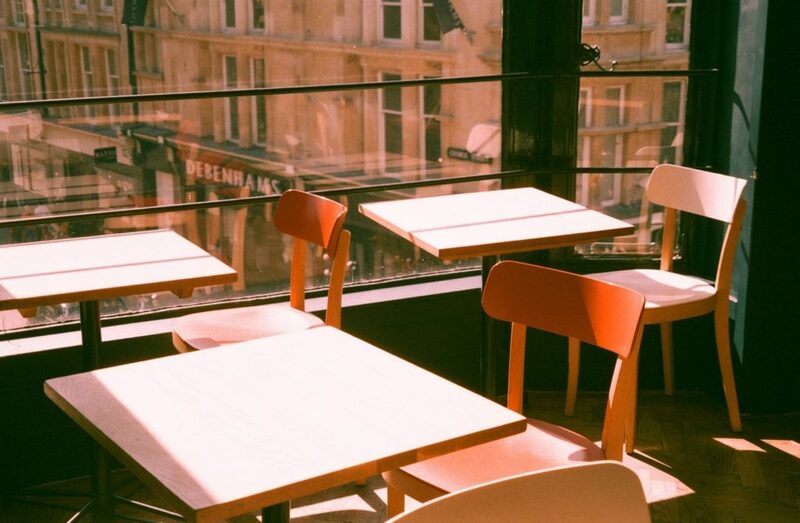 Back in the present, there I am in the cafe, with the afternoon sun shining in on empty tables and chairs. Now I know this image is not of a school. This is a cafe. But if I think of the things that define a school, well one of the defining images is of course tables and chairs, and I’m conscious that these empty tables and empty chairs…well there’s an echo of school in there. Did I want to take a picture of an empty cafe, or was I trying to capture the meaning for me of that afternoon light? This is the thing about nostalgia and memories. There are fragments of things that I remember, but they get processed through life as I get older and they get joined together with other ideas in my mind and in my heart. So the concept of an empty classroom and an empty school on a summery evening now becomes joined together with a cafe that’s empty at the same time of day. What we ultimately see is a unifying image, one of empty tables and empty chairs that draws one memory out into the present day, and it does make me think if a lot of my photography isn’t subconsciosly driven by nostalgia. Now what I mentioned earlier on which is “feeling tones”, and these are something I’ve only understood or got to know about in recent years. My understanding of feeling tones is that they are a way of explaining how all of the sensory elements of our lives collectively make up a feeling tone, much like the physical parts of an instrument combine with where the instrument is played to make up the instrument’s tone. You may or may not know for example that the clarinet and the saxophone use the same type of single reed and mouthpiece, but the clarinet has a cylindrical body made of wood, and the saxophone has a conical body made of metal. These differences are what make the clarinet sound different to the saxophone, although they have a common origin. Add to that the difference in sound depending on where the instrument is played, for example in a small room, or an outdoor stage, and you can begin to see how the idea of a tone as a collective noun is something made up of many parts. Thus it is with feeling tones. We don’t just see an image of something with our eyes, we experience that thing as part of all our other senses, including sounds, scents, temperature and even time. Everything comes together to make up a feeling tone. So when it comes to a nostalgic recollection of a feeling tone, you may only get one sensory trigger, but from that one sensory cue, and that might be sound or it might be visual, or it might be scent, this single cue triggers all sorts of other memories and you don’t just suddenly have that single sensory recollection in your mind, you can suddenly remember how it felt at the time that you are reminded of. “Hey I’m here, remember me? Remember that afternoon? I’m still here – it was just like this…do you remember?”. So there’s this idea that you’re not just remembering the one sense that triggered off the nostalgia, you’re remembering everything. You remember how everything felt. Now I may have been 11 at that after school art class, but as I sit here I am now much, much older. I’m 47 and about to turn 48 and as I understand it, or at least as science tells me all of the cells in my body are replacing themselves all the time. So it’s no surprise therefore that there very possibly is a very strong nostalgic drive to my photography, and not always a conscious one, and I thought it was worth reflecting on this, because as I’ve said before we have the technical aspect of pictures. The camera makes a difference to the image, and the film makes a difference to the image. But the camera and the films can’t take any pictures on their own. They need that human being to point the camera in a certain direction and to press the button at a certain time, and that’s an enormous influence on the image. What motivates the photographer is different for every single photographer, and for me I just wanted to acknowledge that I was somehow trying to capture a feeling that’s echoed across time for me over the years. It’s the same feeling, the feeling of the end of the day and the empty building, whether it is this cafe or my old school. What we see is a picture of today, driven by the past. This entry was posted in Memories, Photography, Writing. Bookmark the permalink.